White House Ban On Militarized Gear For Police May Mean Little : The Two-Way An NPR analysis of equipment given to police agencies by the Pentagon since 2006 — 84,258 assault rifles, 951 armored vehicles, for example — found a vast majority of it would fall outside the ban. 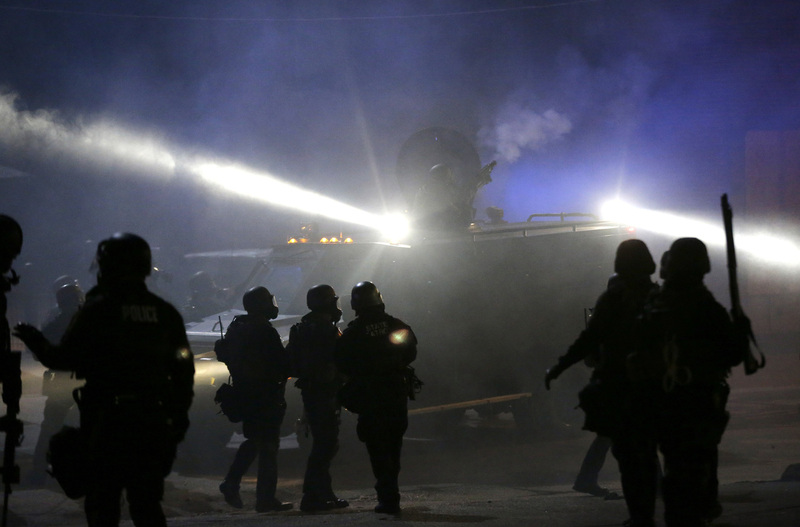 Police in riot gear stand around an armored vehicle as smoke fills the streets of Ferguson, Mo., in November 2014. When riots erupted last fall on the streets of Ferguson, Mo., police in riot gear fanned out armed with assault rifles and armored vehicles made for the battlefield. Analysts said at the time it was just another symptom of the continued militarization of local police forces. This week, the White House announced a series of steps intended to address the kind of policing issues brought to light by the violence in Ferguson and later in Baltimore. One of those steps bans police from obtaining some military-style equipment — including tracked armored vehicles, weaponized aircraft and high-caliber weapons — from the U.S. government. President Obama said the militarization can sometimes make residents feel like there is "an occupying force" in their neighborhood. "It can alienate and intimidate local residents, and send the wrong message," Obama said in Camden, N.J., a city that has been beset by violent crime in recent years. "So we're going to prohibit some equipment made for the battlefield that is not appropriate for local police departments." However, an NPR analysis found that the White House ban may have little impact on the ground. The Pentagon is the largest government source of military-style equipment to police, distributing or selling it to departments across the country. The federal government does not have a centralized means of tracking exactly how many weapons it gives or sells to police through multiple programs, according to administration officials. But one of the largest such programs does keep detailed records. That Defense Department program, known as "1033," gives police forces equipment the Pentagon no longer has use for. We looked at the equipment distributed to local police agencies from January 2006 to March 2015, using data released by the Defense Logistics Agency. An analysis of that data showed the vast majority of the military-style equipment distributed by 1033 would still be available to local agencies. The banned equipment represented a minuscule portion of equipment already in the hands of police. -- The distribution of firearms .50-caliber or higher is now banned. But the 1033 program didn't distribute a single such weapon to local authorities during the time period. -- All 84,258 rifles — including assault types such as M16s and battle types such as M14s — that were distributed to police departments would still be made available to local agencies. These rifles fall below the .50-caliber threshold. -- "Tracked armored vehicles" are now banned. But very few of 1033's mine-resistant, ambush-protected vehicles (or MRAPs) distributed to local agencies had tracks. In fact, nearly 87 percent of them have wheels. -- The new rules also prohibit "weaponized aircraft." But of the aircraft listed in the data, none was specifically listed as having weapons. Ninety-seven percent of helicopters were listed as utility, observation, trainer, medevac or search and rescue — the other 3 percent were simply listed as "aircraft, rotary wing." Seventy percent of airplanes were listed as cargo, utility or flight. The others were simply listed as "aircraft, fixed wing." -- 6,635 bayonets and 175 grenade launchers were handed out from 2006 through March 2015. All bayonets and grenade launchers are now prohibited. The government is trying to figure out which police departments got these types of banned equipment. A footnote in the new White House initiative states that it's still being determined whether those law enforcement agencies should give up the equipment. Pete Kraska, a professor at Eastern Kentucky University and one of the premier scholars on the militarization of the American police force, called the White House proposals "symbolic politics." "This is an attempt by this administration and all the stakeholders to pretend as if they're doing something when everybody knows in their heart of hearts that they are not," Kraska said. An Obama administration official laid out some of the thinking behind the ban on certain equipment. The official, who is knowledgeable about the policy but not authorized to speak publicly about it, said the 1033 program is one of seven that provides money or equipment to local police. When drafting the banned weapons list, the official said, the task force considered equipment currently issued or bought through these programs, as well as equipment that could be acquired by local police in the future. The official said it's a mistake to think that this recommendation alone is a "silver bullet" for correcting issues with local policing. Rather, the official said, it is "one tool" to address those issues. White House Press Secretary Josh Earnest echoed that statement during a Tuesday briefing, saying the administration knows that in some cases these policies would not "dramatically change" the relationship between police and their communities. "What we're hopeful that it will do, is, it will contribute to the effort to try to de-escalate some of that conflict," Earnest said. "And that's what we're hopeful that will do." The issue of the militarization of police is not new. Local police began acquiring significant amounts of military-style equipment after the urban riots of the 1960s. President Lyndon B. Johnson signed a law in 1968 that gave local police grants to purchase equipment to suppress riots. As Radley Balko writes in Rise of the Warrior Cop: The Militarization of America's Police Forces, President Richard Nixon then declared a rhetorical war on crime and drugs, which was followed by President Ronald Reagan's real war on drugs. Police began acquiring tactical equipment to conduct raids, and as they seized property, local forces found themselves with more money to buy equipment on their own. The 1033 program, one of the main sources for military-style equipment for local agencies, was created in 1990 when Congress authorized the Department of Defense to transfer excess property to local law enforcement. It was intended to help drug-enforcement efforts, but was expanded in 1997 to include other law enforcement purposes. In a report last year, the American Civil Liberties Union concluded policing in the U.S. had become "excessively militarized." It found, for example, that 79 percent of SWAT team deployments were for the purpose of simply executing a search warrant. Only 7 percent of deployments were for "hostage, barricade, or active shooter scenarios." SWAT teams also were found to be more likely than other police to use "violent tactics and equipment." The ACLU called on the federal government to rein in "the programs that create incentives for local police to engage in excessively militarized tactics." ACLU legislative counsel Kanya Bennett said the group applauds the White House measures announced this week as "a step in the process of reform." "We certainly would have preferred an outright prohibition or ban on some of those items, like the M-16s or the MRAPs. However we feel like there are a lot of hurdles that police departments now have to jump through in order to justify receiving this equipment with federal resources," she said. The administration official made much the same point, saying that while the equipment ban has dominated headlines, a bigger part of the program involves new conditions for agencies seeking to acquire most types of military-style equipment. Not only that, the official said, but this is the first time all government programs are under the same type of restrictions. -- Train officers on the proper use of the equipment. -- Train officers on policing in a constitutional manner. -- Come up with a mechanism that seeks input from the community about the use of such equipment. -- Keep records on "significant incidents," which are defined as the use of equipment in a violent encounter or during a demonstration. Kraska said this part of the policy also doesn't impress him. "In the entire 25-year history [of 1033], the federal government has never provided any real, competent oversight for this program and where these weapons go and how they are used," he said. "And for us now to think that all of sudden we're going to have this tremendous new oversight, I think is ... naive." He also notes that the new policy doesn't address the fact that police departments can still use their own money to buy military-style equipment from non-federal sources. The White House report announcing these changes points to the recent riots in Ferguson. But data from 1033 show that Ferguson police and the St. Louis Police Department received few items from the Pentagon program. CNBC reported at the time that the equipment was bought directly by the police departments, probably using local money as well as some federal grants. The departments may have even bought some of the equipment from private companies. The administration official said the U.S. simply doesn't have the authority to put restrictions on local equipment purchases that don't use federal funds or come from the Pentagon. The processing scripts used in this analysis are available as open source software and the methodology is described in depth on the NPR Visuals blog.